Bookplate About Ex Libris, Exlibris, bookplate. Exlibris. Czech bookplates. Ex Libris Exlibris. 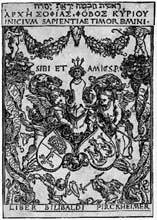 The modern Czech bookplate - Ex Libris - making has started around the year 1868, with the oldest bookplate for the Knight Vojtech Lanna by Josef Manes. Among the Czech bookplate / Ex Libris / makers belonged other great contemporary Czech artists such as Alfons Mucha, Max Svabinsky, Vojtech Preissig, Mikolas Ales. Bookplate collecting even knows the date of its beginning. An article in the Moderni Revue magazin of 1897 by a poet and the first collector of Ex Libris, S. K. Neumann is considered to be the first trace of the organized bookplate collecting. Since then, the great interest in book markings and collecting them, has continued. 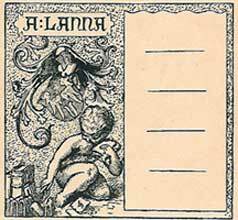 Bedrich Benes Buchlovan informs us of as many as five thousand Czech bookplates as early as in 1926. With the time going, the bookplates / Ex Libris / changed their characteristics and from the book markings of an owner of a book, it had been transformed into a collectors' object of interest. Even contemporary artists have nourished the tradition of the bookplate, for example E. Haskova, M. Houra, J. Liesler, J. Pilecek, K. Benes and many others. Association of Collectors and Friends of Bookplate (Spolecnost sberatelu a pratel ex libris - SSPE) founded in 1918 has contributed greatly to the promotion of bookplates and of bookplate collecting. The Association issues a magazine quarterly called The Book Marking (Knizni Znacka), that being a thirty-two pages brochure. About bookplate / Ex Libris /. Bookplate - Since the fifteenth century, distinguished artists and their patrons have given serious attention to this art form. It represents a miniature art developed to adorn books and a convenient, individualized way for the book’s owner to be identified. The bookplate or ex libris, is a label placed on the inside of the front cover of a book, bearing its owners name and a sign of personal identification. The words ex libris on a bookplate translate roughly from the Latin as "from the books of" or "from the library of." Many techniques and mediums are used in creation of exlibris, bookplates. Some include the woodcut, engraving on metal, silkscreen, etching or pen and ink. This, along with the fact that the work is all done in small scale, plays an important part in the execution of these works. Also, utilizing the finest in papers, with hand printing in many examples. Marc Chagall, M.C. Escher, Rockwell Kent, Leonard Baskin, Barry Moser, and others. Ex libris enthusiasts have created an international network for the purposes of attaining designs by establishing societies in forty-one countries. Through participation in these societies worldwide friendships can grow. Every two years an International Ex Libris Congress is held in a different country inviting members of the world bookplate societies to attend. Under the auspices of the Federation International des Societes d’Amateurs d’Ex Libris (FISAE) one enjoys lectures, slide presentations, exhibitions and sufficient time is allowed for socializing and trading bookplates. This provides endless opportunities for artists and collectors to acquaint themselves with the interest and enthusiasm for this art form in other countries. A Publication of: The American Society of Bookplate Collectors and Designers.